This weekend, volunteers laid wreaths on military graves across the country as part of Wreaths Across America. 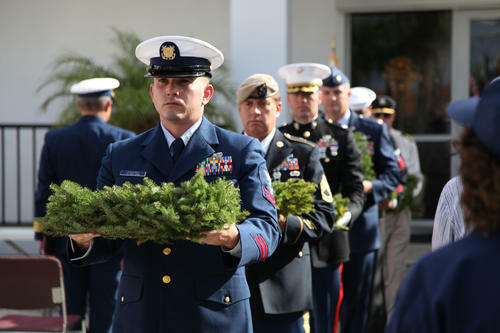 Service members at Coast Guard Station Lake Worth Inlet in Florida also laid wreaths on the water Dec. 15 to honor those lost at sea. Five years ago, Coast Guard Auxiliarist Ed Greenfield realized that even if every grave on land was covered, some who perished while serving their country were being forgotten, according to the Coast Guard’s official blog. The first annual Wreaths Over the Water memorial was held on Dec. 15, 2007 at Station Lake Worth Inlet. This year, representatives of the Coast Guard, Army, Marine Corps, Air Force, Navy, Merchant Marines and POW/MIA laid wreaths on the water to remember members of every service who died at sea. Great occasion to complement Wreaths across America. i think this one way in celebrating and commemorating those who serve and protect our freedom and liberty in shores and off shores. with this we may give at least honoring them though we never met this men!